Beats, lyrics, spoken word, and a message of hope from healing hearts. Five Native artists are bringing performing arts to boarding/residential schools and reaching into the lives of youth with the “Heal It” tour. “All it takes is one moment of inspiration to change the course of a young Indigenous person’s life,” Tanaya Winder (Duckwater Shoshone Tribe) says. When she lost a close friend from her reservation community to suicide several years ago, it led to Tanaya’s journey of healing through poetry. She “re-members” with words, piecing communities back together. Tanaya is a 2017 First Peoples Fund Artist in Business Leadership (ABL) fellow, spoken word poet, and founder of Dream Warriors Management. Dream Warriors Management advises and assists Indigenous artists and educators in pursuing their passions. “A Dream Warrior is someone who uses their passion, dream, or gift to provide for their loved ones and community while understanding the responsibility in using the gifts he/she has been given,” Tanaya says. A part of her 2017 ABL funds went toward a retreat for Dream Warriors artists, which led to them writing a song together: The History of Hearts Breaking. Cafe Cultura serves as the Dream Warriors’ fiscal sponsor, and this year First Peoples Fund partnered with them to support their youth programming through the Our Nations' Spaces (ONS) grant program. For Tanaya, it helped several pieces fall into place for Dream Warriors Management. One of the Dream Warriors, Lyla June (Diné / Cheyenne) — public speaker, poet, hip-hop artist and acoustic singer-songwriter — felt a calling to reach out to Native youth at boarding schools. 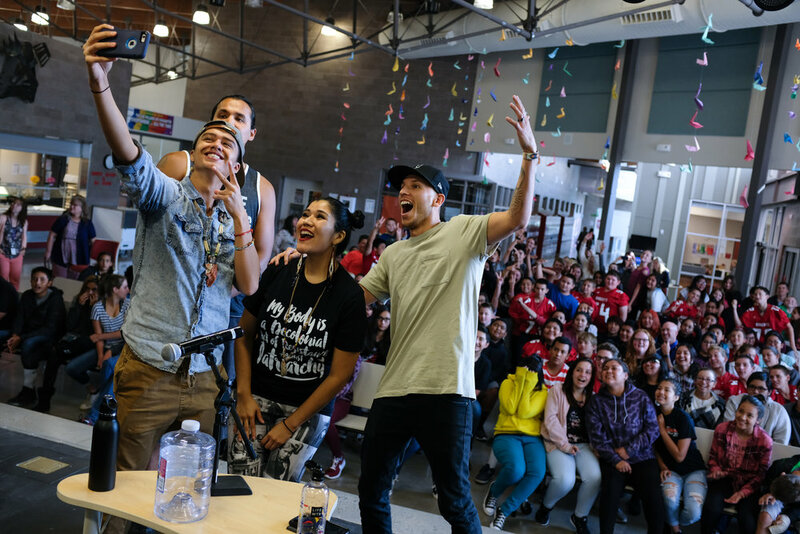 Combined with Frank Waln’s (Sicangu Lakota) hashtag #healit and the ONS grant opportunity, the artists agreed to do work visiting boarding schools, centered around sharing a message of healing. “I realized we could use Our Nations’ Spaces to do Lyla’s idea about visiting the boarding schools and call it the “Heal It” tour because that’s what we’re going to do,” Tanaya explains. The ONS artist partners include several First Peoples Fund alumni — Frank Waln, Paul Wenell Jr. (Leech Lake Band of Ojibwe), who performs and records under the name Tall Paul, Mic Jordan (Ojibwe), and Tanaya Winder. The partners are collaborating with Razelle Benally (Oglala Lakota / Diné), 2017 First Peoples Fund fellow, to produce a music video to promote the tour. The Dream Warrior artists are setting out on this group tour with a collaborative album/EP that highlights the journey of each of the artists to let youth know, we’ve been there. We know what you’re going through. In 2017, Mic Jordan used his First Peoples Fund ABL fellowship to build on his #DearNativeYouth project. At workshops and performances across the country, Dream Warriors see the change in their audiences. “The Heal It Tour is important to me because we’ll be performing and speaking to Indigenous boarding school youth around the country,” Paul says. His 2017 ABL fellowship focused on a challenging concept album, G.O.A.T. (Greatest of All Time), inspired by Sac and Fox tribal member Jim Thorpe who went to Carlisle boarding school. Dedicated to the hard work and heart work of this project, the Dream Warriors prepare for the 2018 fall launch of the “Heal It” tour. They will also apply to perform at the regional conference for the National Association for Campus Activities held in 2019. They see this project continuing, and will spend time in December planning the next leg of marketing, promotion, and fundraising. They want to #healit. In 2011, First Peoples Fund began facilitating the Our Nations’ Spaces program with support from the Ford Foundation and expanded the program in 2015 with support from The Andrew W. Mellon Foundation.